"Integrity, honesty and confidentiality are the main cornerstones of LAUNCH Funding Network." 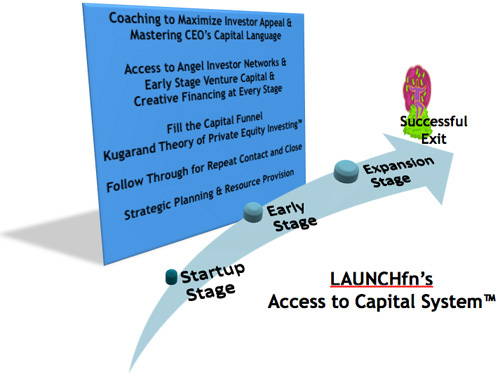 LAUNCHfn's 'Access to Capital System' to Reach Early Stage Venture Capital Investors, Small Business Investors, Angel Groups to Find Angel Investors & 1000s of Business Funding Sources including Working capital loans. Offering Investor Relations for Reg D 506c, Reg A+, and crowd funding campaigns. Kugarand Capital Holdings, LLC is a leading strategic advisory and investor relations firm helping entrepreneurs prepare for and obtain early stage and growth capital. KCH rolled out the LAUNCHfn 'Access to Capital System'TM in 2007 and it has proven to be an effective system for entrepreneurs to connect with early stage venture capital and small business investors. The CEOs that engage LAUNCHfn to be strategic advisers to them attract more early stage venture capital and small business investors for their business quicker than those companies that seek to find angel investors and meet with angel groups without the benefit of our knowledge, experience and our vast network of early stage venture capital sources, private equity funds and business loans. Take Action! Sign up for our free investor tips on the right. Click on the link below to take a short cut to the info or service you are seeking. Frustrated that Investors not "getting it"? Find out why. Get the skills and confidence to raise your seed round of capital with this proven program. Learn More About our Kugarand Capital Holdings Direct Public Offering Programs- Crowd Financing programs. Just want to talk to an expert and ask questions, sign up for a FREE 30 min expert call with Karen. LAUNCHfn is directly connected to the The National Network of Angel Investors. Forged from the legacy of NBAI, once considered the most active angel group in the Southeast and named by Inc Magazine as one of the top 50 angel investor networks in the United States of America. The National Network of Angel Investors is a fresh approach to traditional angel networks. It is growing society of private business investors that have a proven track record of growing the companies they are charged with leading. They seek to exercise the economic power they have gained through their years as executives and provide it as growth capital to enterprising and worthy private companies with high growth potential. As NBAI, they met for over a decade in Atlanta on a regular basis to see presentations from qualified companies raising early stage angel investment and venture capital. With the dawn of Direct Public Offerings, this group has transformed into a national network that considers deals that have been vetted by a team of professionals for their consideration through the secure and private platform offered by Kugarand Capital Holdings. The education and access to capital system provided by LAUNCHfn is estimated to have helped over 60 companies attract $25,000 to $5 Million in capital totaling well over $100 Million. We estimate over 500 jobs have been created as a result of the knowledge, expertise and access to capital we have provided entrepreneurs over the years. "Where Angel Investors and Early Stage Venture Capital Connect with Innovative Companies"
Learn more about the companies we have helped visit Actual Investments and Testimonials pages. Our funding resources include: private equity angel investor networks, early stage venture capital, accredited small business investors, institutional finance, early stage capital, capital investors, angel groups, early stage venture capital firms, PIPE funding sources, working capital loans, purchase order finance, business lines of credit, and other forms of small business finance. With the changes in securities regulations, we are proud to now offer investor relations services for authorized and approved REG D 506c, REG A+ and select crowd funded campaigns. For High Net Worth men and women who value their time as much as their wealth. Learn how to apply your knowledge of stock investing and real estate investing to purchasing a percentage of many companies. By investing in the passion and power of ambitious entrepreneurs with innovative winning ideas, you multiply your ability to create wealth without having to start the companies yourself. LAUNCHfn, NBAI Innovative Investor Network, The National Network of Angel Investors, Angel Investing 101 & the Inside Secrets to Angel Investing, KYRMedia, the Facebook Group RUN with the BIG Dogs, the Compassionate Capitalist Radio show, the Angel Investor Matchup Golf Tournament, the Money Hunt Educational Series and the Southeast Private Equity Conference are all part of the operations holding company, Kugarand Capital Holdings,LLC. Copyright initiated in 2001 and valid to current date. NOTE: All credit card charges are handled securely through Authorize.net and will show up on your bill as Kugarand Holdings. Refunds will be issued if request is received within 24 hours and no service has been provided at that point in time. When you are added to the database you will be given the opportunity to opt out at any time. But, note, if you opt of any communications, it will opt you out of all broadcast communications and you may miss valuable announcements about upcoming events for entrepreneurs and investors, exclusive opportunities to gain access to information or participation in entrepreneur and investor opportunities. If you feel you are receiving too many emails or emails with topics that are not relevant to you, you can contact us at info @ launchfn.com to request a change to your profile. Investors, Speakers, Authors, & Experts. Also available for replay on iTunes and Beyond Pod for the Android. How to Pitch to Investors? Copyright © 2004-2016 LAUNCHfn.com All rights reserved. Launch Funding Network is a division of Kugarand Capital Holdings, LLC .